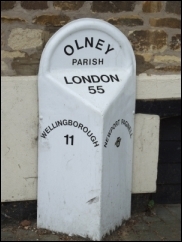 Olney is roughly the same distance from Northampton, Bedford & Milton Keynes: around 12 miles. There's easy access to the M1 Junction 14 & with fast and frequent train links to London from Milton Keynes Central or Bedford. The fastest routes take just 30 minutes. See visiting London below.